Bunk Bed Plans You Can Build for Kids and Adults. Loft Bed Plans too! Bunk Bed Plans You Can Build! Build in One or Two Weekends. Very Affordable and Very Solid. Simple to follow plans to build your own beds. Little or no woodworking experience. Use standard off-the-shelf lumber and straight cuts. Get the look and finish you want. 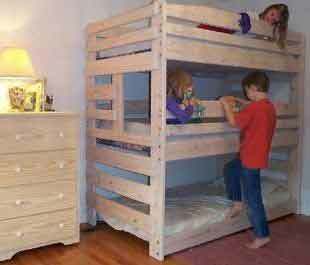 Wood cost to build this Triple Bunk Bed Plan $177. Find out more. Meets all CPSC Federal safety Standards. Designed to hold children or adults. Do you need to estimate the cost of building a bunk bed using these plans? The wood cost for a twin bunk bed from our plans was about $148 in March of 2018. The price may vary in different parts of the country but it should not be significantly more. We are in the process of putting all of our materials lists on each page with the model of bed that you are looking at. This will make it easy for you to get a more accurate estimate for your bed project. We received a repeat order for commercial bunk beds in early 2011 for a local homeless shelter. I had a chance to view the 50 beds that we had built for the shelter about 12 years previously. These beds had been in use every night for nearly 12 years and they were still in excellent shape in terms of both structure AND appearance. These get used by all sizes of people every night. Many facilities like this have purchased beds that we have built and they are still using them. Think you or your kids can break them? We still have the first one that we built 22 years ago and despite being used by all of our 6 kids and being moved numerous times, it is still as solid as a rock! Why should you buy our plans to build your own beds? Our plans are easy to follow and we offer free technical support. You do not need a lot of tools to build these bunk beds. We give instructions for building your beds using a circular saw, an electric drill, a power sander and a few tool bits. All of our Bunk Bed Plans are designed to meet all of the U.S. government's Consumer Protection Safety Council guidelines for for safe beds. 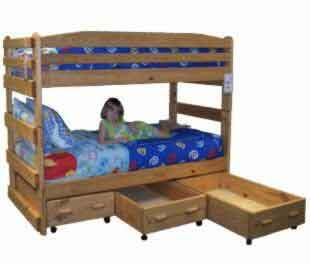 These beds are designed to hold up to even large adult usage for many years and they are safe for kids too. Free Bunk Bed Plans are worth what you spend on them. These are the same designs that we have used to build beds for camps, shelters, hotels and many other commercial uses. They last for years and hold up well. If you concerned with the amount of weight your finished bed will hold, look at this picture of five grown-ups in one of our bunk beds built from our plans. *Free Shipping on all hardware kits to all 50 United States. Canadian customers will be charged $35.50 US for each hardware kit for shipping. All others outside of the US please contact us for shipping prices. We will endeavor to ship to you as economically as possible.